Global semiconductors specialist, ST Microelectronics introduces a new miniature smart sensor that combines a 3-axis accelerometer with an embedded microcontroller in an ultra-compact 3x3x1mm LGA package for advanced custom motion-recognition capabilities. The microcontroller, operating as a sensor hub that runs sensor-fusion algorithms has been combined with a high-precision 3-axis digital accelerometer into a single package called the iNEMO-A, which reduces the demand on the host controller and application processor and decreases power consumption in portable devices. Delivering greater freedom and flexibility to the design of motion-enabled consumer electronics, the integration of high-resolution linear-motion sensing and the sensor hub in a single package also increases system robustness and is ideally suited for board-layout optimisation. ST Microelectronics General Manager, Motion MEMS Division, Analogue, MEMS and Sensors Group, Industrial and Multi segment Sector, Fabio Pasolini explains that customers want smarter motion sensors that integrate both sensing and intelligent decision-making in a single package. The iNEMO family gives ST an unrivalled ability to integrate any combination of accelerometers, gyroscopes, magnetometers and other sensors with a powerful ARM-based sensor-hub microcontroller to give customers maximum flexibility and scalability in system partitioning. 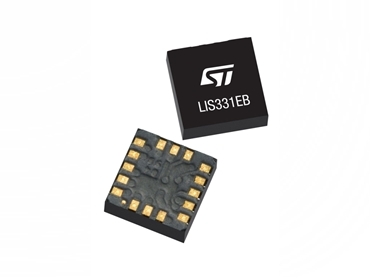 The LIS331EB iNEMO-A smart sensor targets a wide range of applications that include wearable sensor applications, motion-activated user interfaces in phones and tablets, and augmented reality. Addressing power constraints in battery-operated portable devices, the LIS331EB iNEMO-A3-axis digital accelerometer also contains two embedded finite state machines (FSM) and an embedded FIFO (first-in first-out), which enable custom motion-recognition detection, including specific gesture detection, and a pedometer that can run without using the embedded microcontroller, further reducing the overall power consumption. The high performance 3-axis accelerometer in the LIS331EB iNEMO-A features a selectable full-scale range of ±2g/±4g/±8g/±16g and houses an ultra-low-power ARM Cortex-M0 core with 64KB Flash Memory and 128KB RAM memory, as well as multiple timers and I/O ports (GPIOs/SPI/I2C/UART).